The Glycerin 10 is an impeccable balance of cushioning, support and excellent fit and feel. The cushioning adapts to different kinds of running speeds, providing a firm or soft ride depending on the running pattern. Heel to toe transition is superb too, though the outsole wear on heel edge is something to watch out for. The entire athletic footwear industry is moving in a singular direction. Which happens to be – make the shoes more minimal with each passing year. Eliminate overlays. Reduce seams. Lighten up the outsole. Other things of that sort. At the same time, there are brands which buck the trend and go the other way in a quest to carve out their own niche. Take the Hoka One-one for example, with their ‘maximalist’ construction strategy. Oversized, convention defying soles of the Hoka are being lapped up by a certain segment of runners who now swear by them. You also have New Balance playing around with their ‘Fresh Foam’ concept, an apt description of which would be a running shoe with a platform sole. But there’s no escaping the fact that the minimalist philosophy has a strong, vice-like grip even on these maverick outliers. The Hoke One One with their mile deep soles have uppers which look and feel minimal, a stark contrast to what lies beneath. It will not be long before traditional running shoes, with their combination of multiple stitched-on layers, generously padded upholstery and liberally cushioned soles will be few and far between. Shoes like the Asics Gel Nimbus, Kayano and Glycerin remain the last bastion of conventional running shoes, but it remains to be seen how long can they hold out to the tidal wave of minimalism. This wave has long ceased to be just a consumer mindset; it has now ingrained itself into the very design principles of athletic footwear. 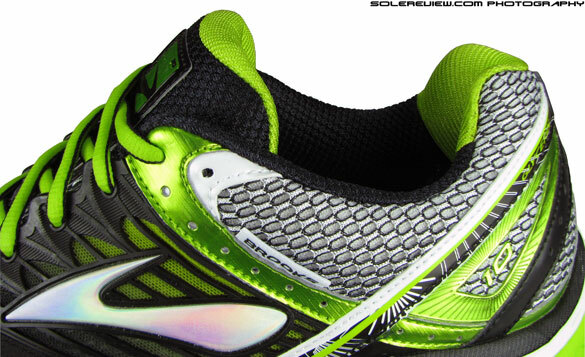 Take a good, last look at the Brooks Glycerin 10, because things will never be the same again. 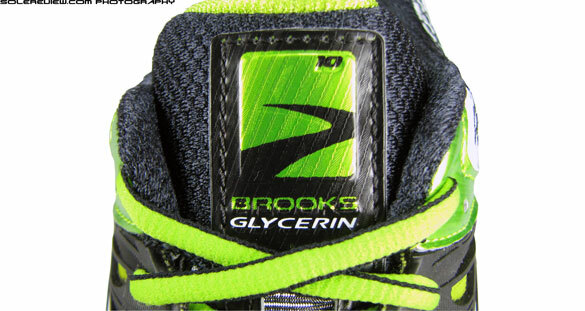 The 2013 Brooks Glycerin 11 take a leap forward into upper minimalism, and the Brooks Glycerin 12 (June 2014) has an entirely new twist. 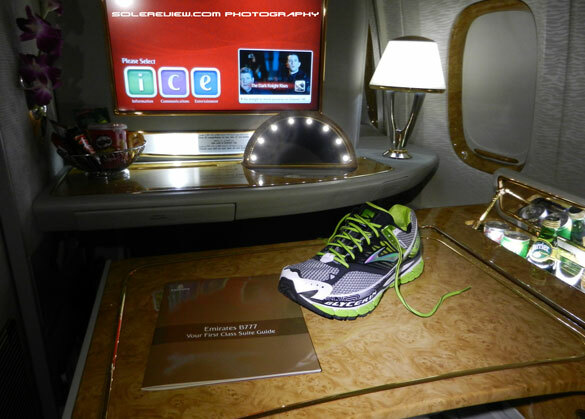 The Glycerin 10 is a near perfect example of cushioned traditionalism, making the cliched ‘first class ride’ phrase actually mean something. Everything about the shoe is top notch. The multiple layers of textured synthetic leather, the plushness of the foam backed inner lining and the incredibly competent DNA gel cushioning. It is undoubtedly the high point of the Glycerin evolution, ten years in the making. Runners will look back at the shoe in a few years time and say, ‘they don’t make them like they used to’. Sadly, that will be true. The plushness of any running shoe is grounded in the upper, and few shoes does this better than the Glycerin 10. The mesh is a tried and tested sandwich spacer type, with a soft lining on the inside and an open structure on top. 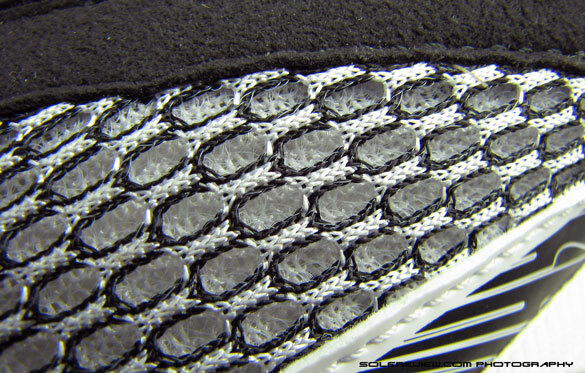 The two layers are connected with thin filaments, giving it the spongy character which runners have to come to love over the years. The tongue feels silky smooth, with generous amounts of foam padding stitched between the layers. The foot is effectively insulated from lacing pressure, and the fact that the tongue is attached to the sides makes the upper fit like a glove. It also stops the tongue from moving sideways. Not to be missed out are the laces, which have a nice bounce and feel pleasantly soft to the touch. In the rear, the collar padding keeps the foot secured in an all enveloping plushness. The collar lining uses two kinds of fabric, both filled with resilient foam. No hard spots, and the height of the sides and heel is just right. Be it the first mile or the tenth, the sensation of running in the Glycerin 10 feels luxurious, both in fit and feel. The Glycerin 10 uses a full length DNA gel cushioning unit inside the sole, and it is no gimmick. 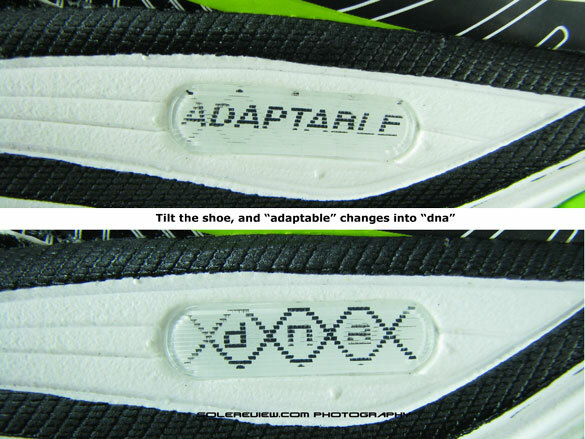 It is a unique cushioning system, because is adaptive. How so? Because the cushioning behavior changes based on what speed you run in. Fast foot strikes will result in a firm cushioning which makes it easier to maintain speed and help gait transition. Go slower, and the sensation is of a much softer cushioning. The DNA gel manages this outcome by reacting to different impact pressures, responding accordingly. We’d like to correct one misconception though. Many websites, including Brook’s official webpage, describes DNA as made of a ‘highly viscous non-Newtonian liquid’, giving the general impression that the DNA cushioning is a sealed bag with dense liquid inside. In actuality, it is a solid, jelly like compound with the promised property of adaptive cushioning. How can we tell? 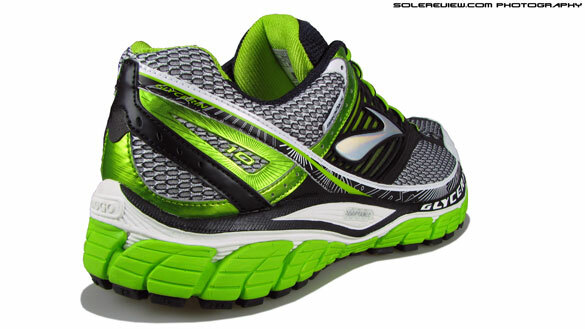 We tore the Glycerin 9 apart, and though it uses a different shape of DNA gel than the Glycerin 10, it is very similar. A full length unit extends from heel to toe, and all of it is solid. That said, we’d like to clarify that Brooks is technically correct though. All Gels are liquid in nature but behave like solids due to its three dimensional cross linked structure within the liquid state. Sounds like a confusing oxymoron? All you need to know is that the Glycerin 10 will not ooze gallons of vile, viscous liquid if the sole is punctured with a nail. 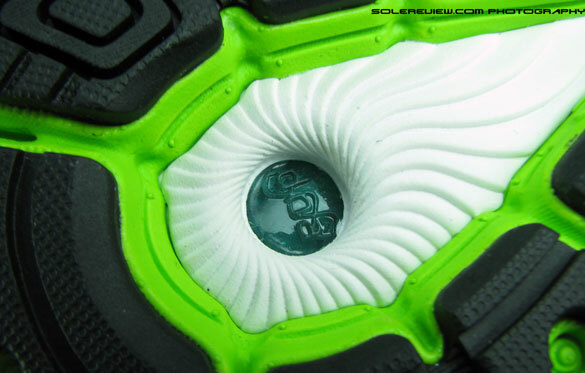 The Gel unit is inlaid with a ‘carrier’ midsole foam which sits on top of a firmer midsole layer. This two-on-one construction keeps the most responsive layer of cushioning on the top, while the firmer base maintains ride consistency. 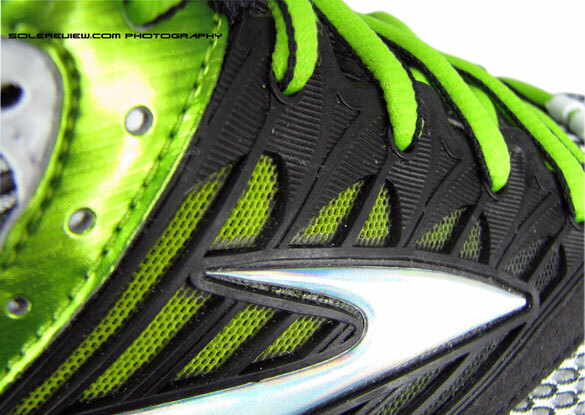 The outsole uses blown rubber in the forefoot, which adds another level of padding underneath. The heel uses a type of hard rubber which is abrasion resistant, but due to the lack of upwards flare or bevel, the edge of the heel is fairly flat and close to the ground. This causes that area to be the first point of contact during foot-strike. Because of this, heel strikers will discover that the rubber on outsole edge is prone to wearing out, even after running just 20 miles in them. The wear decreases once a certain amount of rubber has been shaved off, but this will be an issue which most runners are likely to encounter early in their ownership experience. The forefoot flexibilty comes with a smidge of stiffness, a logical consequence of having a DNA gel pad inside. The latter has flex grooves built in, but it does get in the way of a better bending forefoot. The pro’s of having a DNA gel unit outweighs the trade-off, but runners who place value on forefoot flexibility should be aware of this. 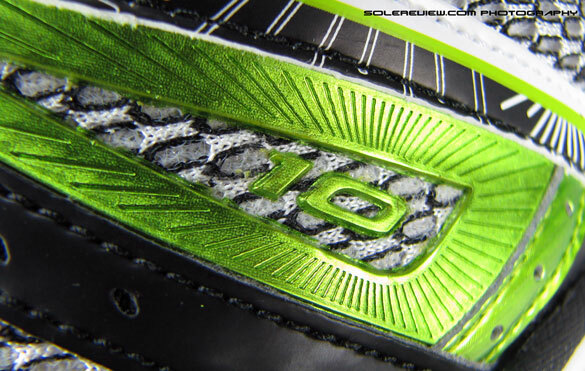 How does the Glycerin 10 differ from the 9? Not much, save a few areas. Things like removing one side of the plastic arch shank, and replacing it with rubber ( same as in Ghost 4 vs 5). 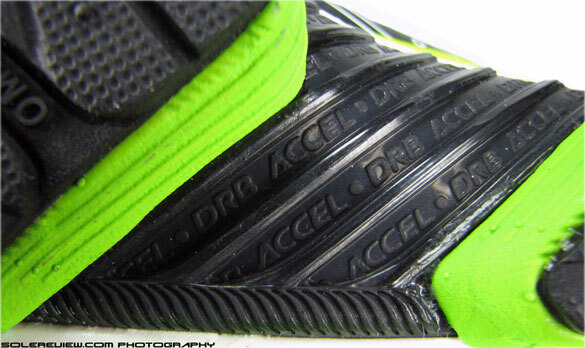 Or an improvement on the collar mesh, where a softer lining appears on the Achilles contact area. The forefoot upper patterns see a revision, making the size of the mesh windows on the sides bigger, resulting in a more relaxed fit. 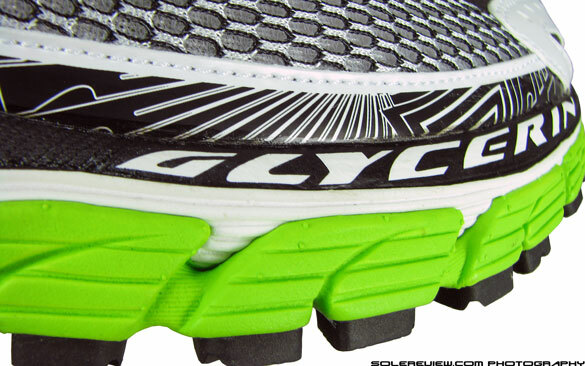 The rubberised upper area though re-structured, works similar to the Glycerin 9 to provide a good mid-foot wrap. Most other elements stay the same, like the quality of materials used, finer upper detailing and the drop-in BioMoGo insole which cups the foot with assuring competence. The Glycerin 10 more or less feels like the 9. The swapping of the plastic shank on the outer side with solid rubber was meant to improve the heel to toe transition, but since the Glycerin 9’s midfoot already had a low overhang, we did not notice much difference during the test runs. At least, it was not so pronounced as it was between the Ghost 4 and 5. Summing up the Glycerin 10 is easy. It is an amazing neutral running shoe. The materials are eye-popping plush, the gusseted tongue, padded collar and rubber panels team up together to result in a great fit. The sole, with its custom-cushioning capability lends versatility to the shoe’s character, its appeal extending to all kinds of runners – the fast daily gazelles, the weekend warriors or anyone else looking for a shoe which makes short work of most demands. But the Glycerin 10 also marks the end of an era; for it will never look and feel the same way again. We don’t need to be a clairvoyant to foretell that – the Glycerin 11 is already here, and version 12 is around the corner, both clear visions of a different future. Good or bad? We will tell, soon.